Infologica Fusion Framework is designed around the component - centric architecture. It provides a unified platform for encapsulation and seamless exposure of business functionality in the form of reusable component services published on the business services bus and available for invocation via the standardized message-based interface. The component services themselves are further insulated from the infrastructure services by using the concept of command-based service interfaces commonly known as adapters. This double layer of abstraction simplifies the job of business analysts in providing definition of business processes and service interfaces. It also creates the sandbox environment for business programmers allowing them to concentrate on the implementation of the business semantics and use the same familiar command syntax to transparently connect to any backend infrastructure service. 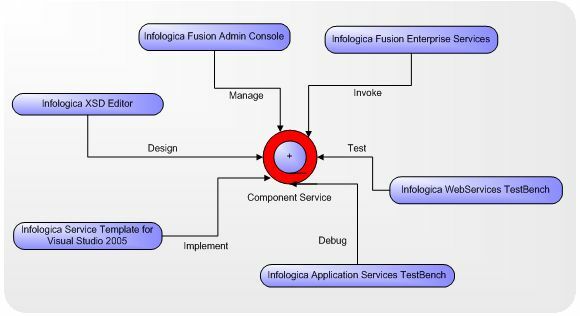 Once the component service is implemented it can be easily debugged, tested, deployed and eventually invoked by any enterprise service from the Infologica Fusion Services Family. In the next sections we will try to cover the main aspects of the component service design and development lifecycle using Infologica Fusion Framework and demonstrate how easily the same component service can be registered with the web services end-point, job scheduler task, file watcher job or event-driven workflow. We will also show in-depth how to configure the service access policy, data transformation, routing and processing rules using Infologica Enterprise Management Console.